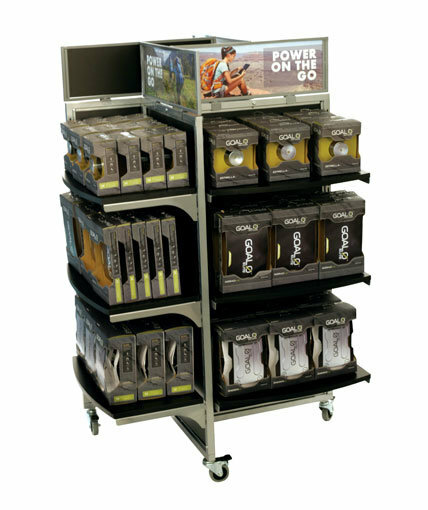 Retail floor display for cell phone accessories, surf apparel, high fashion clothing, toys, boxed electronics and many more. 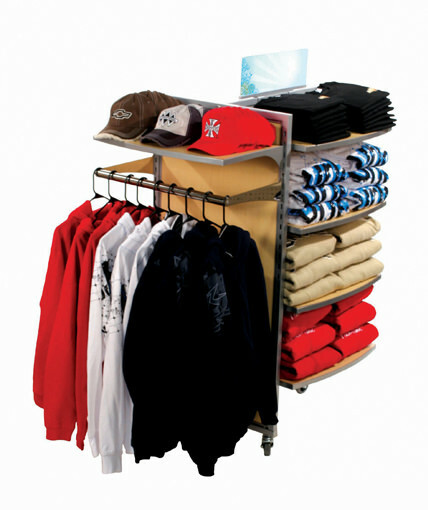 We offer a unique line of highly configurable stock store fixtures. Our SFL (Store Fixture Line) series comes in 3 basic configurations: pinwheel, “H”, and gondola. All of these fixtures utilize knock-down construction and are built using a set of slotted metal tube frames on casters with melamine-finished MDF panels. It is easy to customize these fixtures by changing the melamine finish, substituting graphic panels, perforated sheet metal panels, or bamboo panels for the stock melamine panels and adding custom header signs. All of the SFL fixtures can accommodate a variety of fixture accessories, including shelves, apparel bars, HBARS, hooks, waterfall arms, straight-outs, and sign holders. All of these accessories can be easily adjusted within the slotted frames. 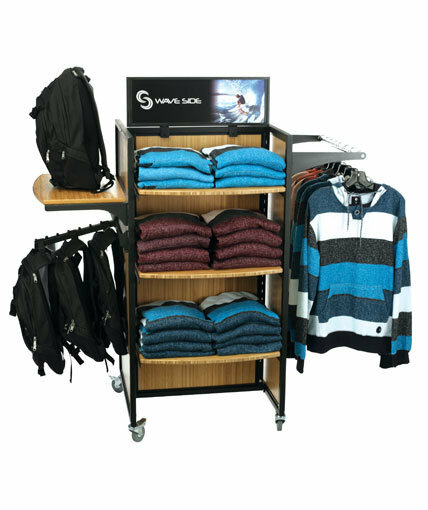 Our SFL line is extremely versatile and affordable. These fixtures are frequently used for all kinds of apparel products, but they can also be used for any product that requires shelves, for hanging products, and many types of general merchandise. We can help you promote your brand and meet tight deadlines by quickly printing header signs or graphic panels in-house. If our stock store fixtures do not meet your exact requirements, let us know. We would be happy to discuss ways we can design a custom fixture for you or ways these fixtures can be modified to meet your needs.